Great pond is a "great" pond for swimming, kayaking and boating. There is a roped off area for swimming and a very small beach. Parking is extremely limited. 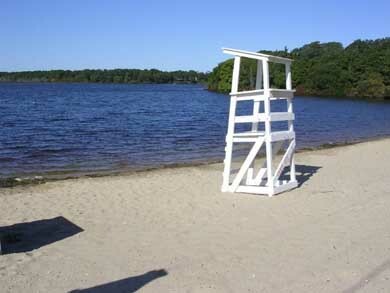 BEAUTIFUL CAPE 3 LEVEL WALK TO BEACH,,OPEN 1 week in-season JULY 13-20..wks IN JUNE/SEPT DISC0UNTED. Relaxing and Delightful Family Beach House. Distance to beach: Fresh water swimming pond is across street. Distance to beach: Cottage is right on the pond!